The Crete’s Great Pumpkin Festival Steering Committee meet today, Wednesday, October 3rd to review the weather and rain forecast for Sunday, October 7thmain festival activities. After much consideration, the Crete’s Great Pumpkin Festival Steering Committee has officially decided to move Sunday, October 7th - 12:00pm – 5:00pm main festival and its downtown activities to its indoor rain location at Doane University’s Fuhrer Field House. Directions to Fuhrer Field House are below. Only Sunday’s main festival events from 12:00pm – 5:00pm will be moved to Doane University’s Fuhrer Field House. All kick-off and pre-festival activities on Friday, October 5th and Saturday, October 6th will continue as planned at their set times and locations. Sunday, October 7th Main Festival Attractions and Events will include: Live Entertainment, Pumpkin Pie Eating Contest, Carnival Games, Craft Show & Farmers Market, Food Court, the Great Pumpkin Giveaway, Bounces Houses, the Great Pumpkin Growing Contest, Horn T Zoo Exotic Petting Zoo, Pumpkin Silent Auction and more. Please note that some Sunday festival activities may vary from the original printed schedule due to the rain relocation. FROM I-80: Take exit 388 South 14 miles (Hwy. 103) to Hwy. 33. Right 2 miles to Boswell Avenue. Follow Boswell Avenue south to 13th St.
FROM LINCOLN: Take Hwy. 77 south approx. 12 miles to Hwy. 33. Take Hwy. 33 west 14 miles to Boswell Avenue. Turn left on Boswell to 13 St.
FROM THE WEST: Hwy 6 and Hwy. 34 to Hwy. 33 (junction between Friend and Dorchester). Follow Hwy. 33 through Crete (13th St.), up the hill to Boswell Avenue. To get to Fuhrer Field House turn left at 13th Street and watch for signs on the right. Festival Rain Location updates are available at the Chamber Facebook Page, Crete’s Great Pumpkin Festival Event Page and at the following websites: www.cretepumpkinfest.com and www.cretechamber.org. For additional questions, please contact the Crete Chamber of Commerce at 402-826-2136, email at office.cretechamber@gmail.com or stop by between the hours of M – F from 9am – 3pm. Come to Crete's Great Pumpkin Festival hosted by the Crete Chamber of Commerce during the weekend of Friday, October 5th through the main event on Sunday, October 7th, 2018 from 12pm-5pm. Due to the weather forecast scheduled for Sunday, ONLY Sunday's 12:00pm - 5:00pm festival has been moved indoors to its rain location at Doane University - Fuhrer Field House located on 1014 Boswell Avenue beside Al Papik Football Field in beautiful Crete, Nebraska. It will be a day full of autumn fun! Modified Rain Schedule of events can be viewed on Sunday's Schedule tab. From the pumpkin carving demo to carnival games, a food court to the Great Pumpkin Giveaway, it will be a day full of entertainment, food, games, and fun the whole family will enjoy! The Crete Chamber of Commerce hopes to see you on Sunday, October 7th, 2018 from 12pm-5pm at Crete's Great Pu​mpkin Festival. It is definitely an event that you don't want to miss! Winners of the Scarecrow and Pumpkin Competitions can earn CRETE CASH! For more information about the festival or to become more involved, visit cretepumpkinfest.com or call the Crete Chamber of Commerce at 402-826-2136. Mark your calendars for October 7th, 2018, it will definitely be a GREAT day for autumn filled fun that the whole family will not want to miss! All Friday and Sunday events are proceeding as scheduled at their set location and times. ONLY Sunday, October 7th's activities have been moved indoors to Doane University's Fuhrer Field House. 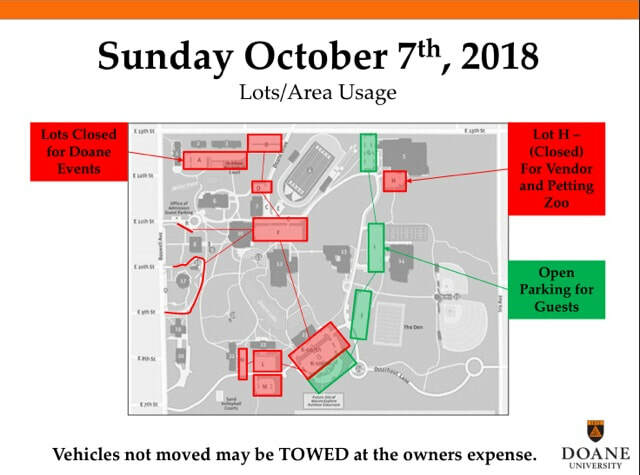 *Please check Sunday's Schedule Tab for Festival Parking Lots and the below map for available parking for Sunday's event. ​On Sunday, October 7th, 2018, for Crete’s Great Pumpkin Festival, please have cash or a check for the the event. ATMs located at Pinnacle Bank, Great Western Bank, or City Band & Trust to withdraw cash for the event. There will be various food court vendors, as well as see all the arts and crafts at the farmers market and craft show. The Chamber is proud to have 35+ businesses, organizations, and groups that will be hosting a carnival game at their booth. Individuals can purchase carnival tickets at the event: $5 for 10 tickets, $10 for 20 tickets, and $20 for 40 tickets to play the various carnival games. Each ticket is $0.50. Also, individuals can purchase a pumpkin voucher for $5 to be able to redeem it for a pumpkin at the event. These vouchers can also be pre-purchased at the Chamber Office or purchased at one of the Information Stations at the event. Information Stations will be located at 12th and Linden by Crete News, as well as the old Shopko parking lot. 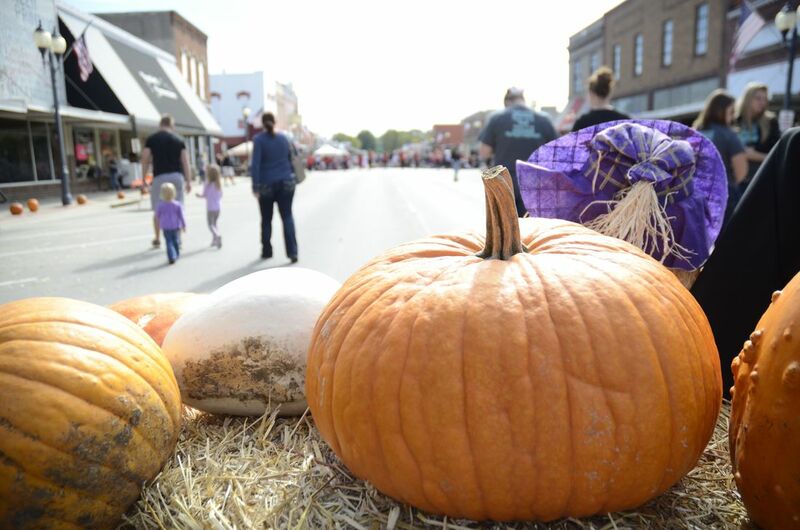 Crete's Great Pumpkin Festival is located in downtown Crete. 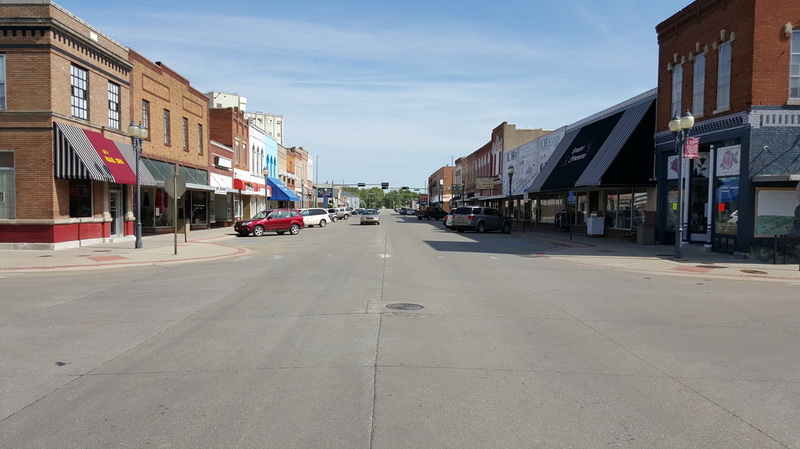 The festival will stretch from 9th Street to 13th Street on Main Avenue. However, due to the weather forecasted for Sunday, October 7th, the festival has been relocated to its indoor rain location at Doane University - Fuhrer Field House. Community Pumpkin Patch is located at Old Mill Park. Old Mill Park is located on 3rd and Norman. Crete's Great Pumpkin Festival Growing Competition Judging is located at Crete City Park on the day of the event. Crete City Park is located on 12th and Kingwood. For the 2018 Crete's Great Pumpkin Festival, the Crete's Great Pumpkin Festival Growing Competition Judging will take place at its rain location at Doane University - Fuhrer Field House located at 1014 Boswell Avenue beside Al Papik Field. Want to Join a Pumpkin Growing Team? Be a participant in Crete's Great Pumpkin Festival today by being on a Pumpkin Growing Team! The Great Pumpkin Festival is the first weekend in October, which means pumpkins need to be planted within the first few weeks of June to be ready for the festivities. Information about growing teams along with some pumpkin growing packet have been distributed to various businesses in the Crete Community. Last year's Pumpkin Growing Team winner of the most pumpkins donated was: Crete True Value. SIGN UP to be a pumpkin grower! All we ask is that you SHARE a portion of your produce for the Great Pumpkin Giveaway! We'll even PICK them up during the Great Pumpkin Blitz! Please TELL us who you are by leaving a Name, Phone # and Email at your pumpkin growing team sponsor! Business or individual with the largest amount of pumpkins donated will WIN Crete Cash during the Great Pumpkin Festival Pumpkin Growing Contest! FREE pumpkin seeds provided by the Crete Chamber of Commerce are available at the following locations: Crete Ace Hardware, Orscheln Farm & Home, Crete Lumber and Farm Supply, and Crete Public Library. For more information on how to be on a pumpkin growing team, please contact Kayleigh Schadwinkel at cretechamber@gmail.com. WANT TO BECOME MORE INVOLVED IN CRETE'S GREAT PUMPKIN FESTIVAL? BECOME A FESTIVAL SPONSOR TODAY! Crete's Great Pumpkin Festival provides numerous opportunity for local businesses and organizations to get involved in the festival. Through the purchases of pumpkin vouchers to hand out to children at the event to be able to go home with a pumpkin, promoting the festival through promotional coloring sheets and much more, there are plenty of marketing benefits and opportunities with becoming a festival sponsor. More information on how to become a festival sponsor will follow. To learn more about being a volunteer for Crete's Great Pumpkin Festival or to adopt a pumpkin for the planting event, please email us your questions or concerns or you can follow us via Facebook to see what's happening with the local pumpkin patch.